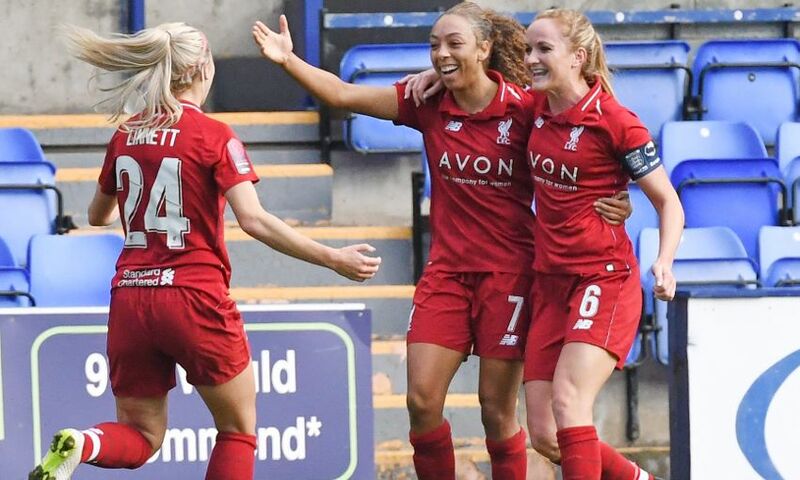 The victory in the Women's Super League encounter was just rewards for the Reds as they dominated the game and carved out some glorious chances. With caretaker manager Chris Kirkland and coach Vicky Jepson in charge, Liverpool FC Women quickly took charge of proceedings. On five minutes a great run from Jess Clarke saw her find Niamh Charles in space, but the winger drilled her effort just past the post. The pressure told with the opening goal after 17 minutes, however. A superb run from Clarke down the right flank saw her perfect cross slotted home by Kirsty Linnett - her first goal in a red shirt. But on 28 minutes the away side levelled when Annie Heatherson managed to find a way past Liverpool stopper Fran Kitching. The Reds responded well to conceding and quickly put the pressure back on their opponents. On 31 minutes a Laura Coombs corner found Charles, who could only head wide from close range. Then Yeovil stopper Megan Walsh made the first of several brilliant saves when she kept out Linnett after a smart turn and shot in the penalty area from the forward. Charles was enjoying a fine match on the left flank and was causing the Yeovil defence endless problems. Just before half-time another brilliant foray forward saw her set up the unmarked Coombs, but her effort was brilliantly kept out by Walsh. On 62 minutes the Reds spurned a golden chance when Rinsola Babajide ran clean through on goal from the right, but her tame effort was straight at the goalkeeper. Clarke was then thwarted twice in succession by Walsh. Firstly, her curled effort which seemed destined for the top corner was somehow kept out, then the 'keeper denied the No.7 from point-blank range. Walsh was looking unbeatable and she made another fine save after Babajide cut inside from the right and let fly with a low drive. Nevertheless, on 87 minutes the winning goal arrived. A storming run from Satara Murray carried the ball into the Yeovil half and she found Clarke out on the left wing. The No.7 cut inside and saw her deflected effort find its way into the back of the net to cue brilliant celebrations on the pitch and the touchline. Liverpool FC Women: Kitching, S Murray, Robe, Matthews, Fahey (Daniels, 86), Bradley-Auckland, Clarke, Coombs, Linnett (Sweetman-Kirk, 66), Babajide, Charles (C Murray, 56).